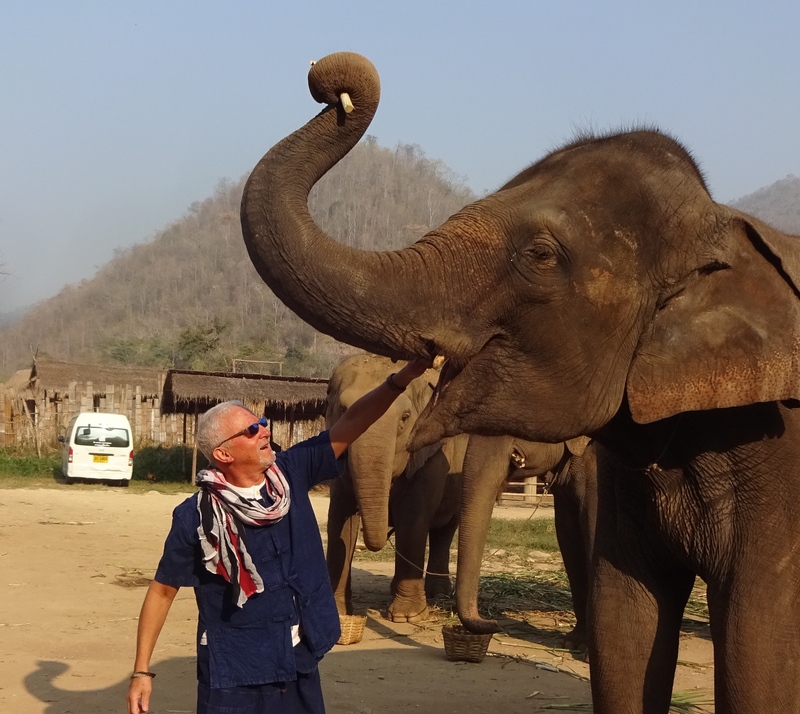 After much research and processing multiple scheduling considerations, we finally booked a half-day with elephants. 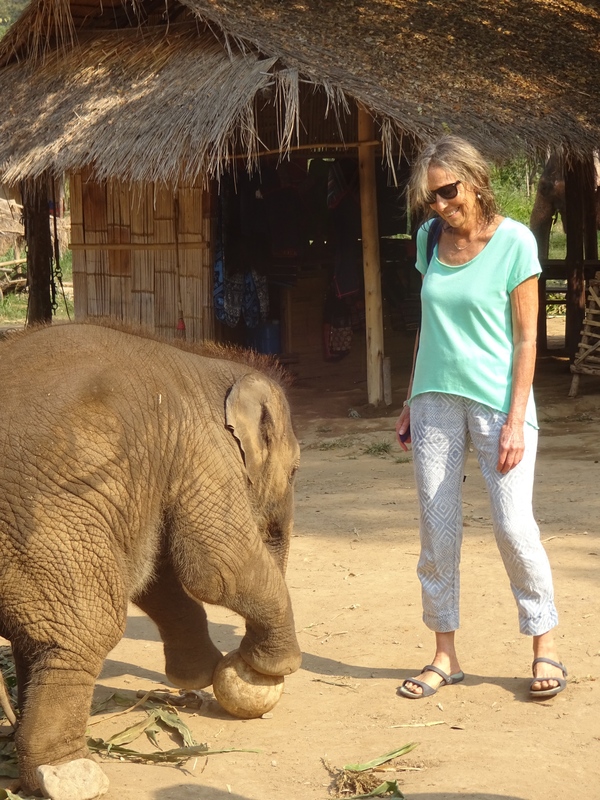 Elephant camps are plentiful here in northern Thailand and there is a very evident serious conservation ethic. There are also elephant “shows,” more like a circus. So choose carefully. The elephant is a ubiquitous symbol of the culture and in the Thai consciousness. An entire souvenir industry revolves entirely around the elephant. Every float in the recent Flower Festival parade had elephants on it. 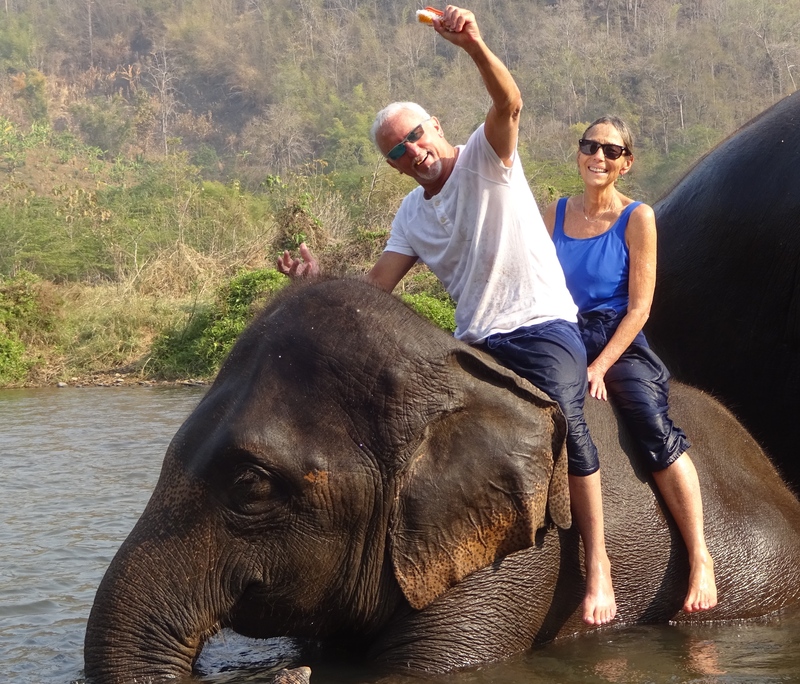 There are quite a few elephant camps in the Mae Taeng area about 40 km north of Chiang Mai that will book half or whole days. Some include extended volunteer stays. But make no mistake, not all elephant camps are created equal. 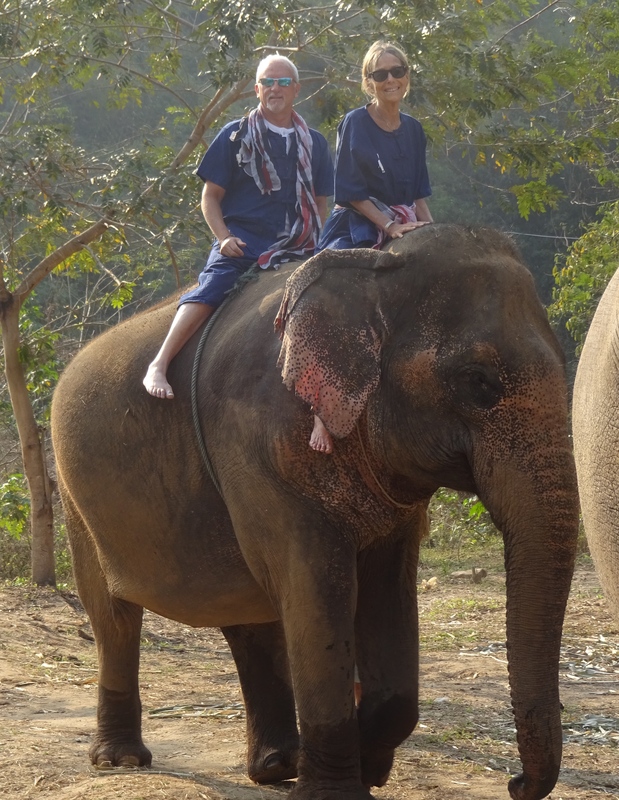 The Elephant Carer Home picked us up at our hotel and drove us to the camp. Waiting until the peak tourist season passed turned out to be a good move. We were the only customers on this day. On arrival, we were instructed to change into mahout gear, after which we were instructed in about a dozen basic commands. We dutifully wrote the commands on our palms just in case we were separated from the elephant group and found ourselves alone in the jungle with an elephant that didn’t speak english. Right. Then we fed a couple of elephants from a basket of cut sugar cane. They also eat bananas and some leafy vegetables. These pachyderms pack in about 250 kg per day. Besides the ones in our group, there were others roaming the property as well as a mother and baby in an enclosure. Ten elephants require about 2500 kg of food. Per day! Our caravan was four elephants, four mahouts and the tour guide who was taking dozens of photos with my camera and Sara’s cell phone. We lumbered down to the river, crossed over to a path on the other side and down river to a bathing area. We scrubbed and splashed and washed and sprayed and got very wet. Then we hauled back on top, looked at our palms and realised they were entirely free of the commands we had written. Egads! Fortunately, elephants are very social. They follow the leader all the way back to camp. Whew! That was close. Riding atop an elephant is a rocky experience, as in rock-y and roll-y. Sitting forward on the neck is more stable, but sitting on top is a challenge. There isn’t anything to hold onto except the rope wrapped around her belly. The skin? Like leather. And the hair? Like a wire brush. 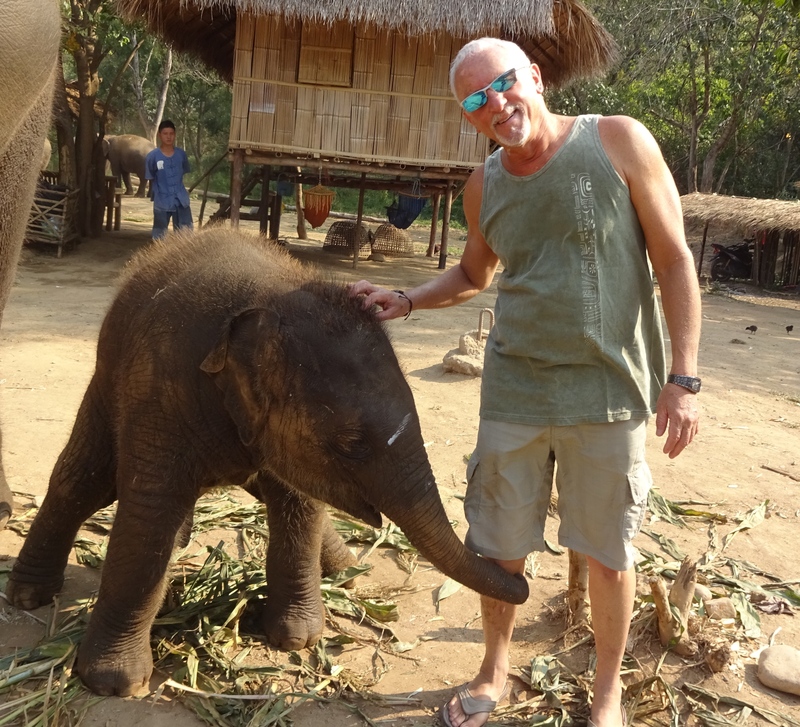 Back at camp, the baby elephant was loose. He posed with me. Then played soccer with Sara. 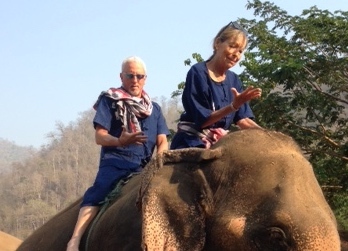 One very important detail: here at Elephant Carer Home, we saw no chains, no restraints whatsoever. The mahouts do not use sharp objects and we never saw them strike these magnificent beasts. They (the elephants, I mean) were well-trained, but they are also very intelligent, as we know, even playful. 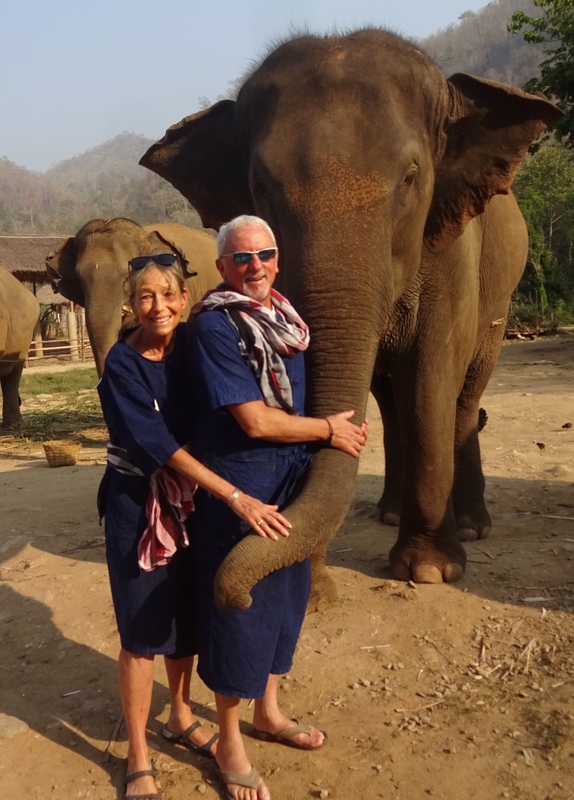 This entry was posted in Personal, Thailand, Travel, Uncategorized and tagged Chiang Mai elephant camps, elephant camp, Elephant carer home, Mae Taeng elephant camps, Thai elephant camp by garyhorvitz. Bookmark the permalink. It was too brief. A little hurried, in fact. But so worthwhile. I can imagine how enriched you were by the experience. Thank you Gary for your due diligence in your search. I appreciate that there are many elephant sanctuaries. And yes, not all are equal – some are disguised in order to use the elephants for profit; while others use the funds raised to care for these rescued beings. Though, I don’t know this particular one, It is my belief that a true elephant sanctuary would not have us riding the elephants. I would imagine it difficult to raise funds for conservation without offering rides–a visceral anchoring of the experience for which there is no substitute..